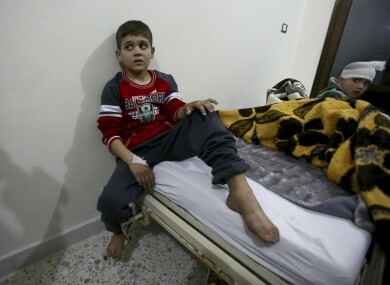 Syrian boys, evacuated from Aleppo, sit in a field hospital bed near Idlib, Syria. TRAPPED SYRIAN CIVILIANS and fighters waited desperately today for evacuations to resume from a rebel-held enclave in Aleppo as the Red Cross pleaded for a deal to “save thousands of lives”. A rebel representative told AFP agreement had been reached to allow more people to leave the city which has been ravaged by some of the worst violence of the nearly six-year war that has killed more than 310,000 people. But there was no confirmation from President Bashar al-Assad’s regime or its staunch allies Russia and Iran, which are under mounting international pressure to end what US President Barack Obama denounced as the “horror” in Aleppo. Families spent the night in freezing temperatures in bombed out apartment blocks in Al-Amiriyah district, the departure point for evacuations before they were halted on Friday, an AFP correspondent reported. Abu Omar said that after waiting outside in the cold for nine hours the previous day, he had returned on Saturday only to be told the buses were not coming. “There’s no more food or drinking water, and the situation is getting worse by the day,” he said, adding that his four children were sick because of the cold. The International Committee of the Red Cross (ICRC) appealed for safe passage for the thousands of people including women, children, sick and injured who waited through the night “in constant fear and anxiety”. “People have suffered a lot. Please come to an agreement and help save thousands of lives,” said ICRC Syria delegation head Marianne Gasser. Email “Desperate civilians wait for evacuations from Aleppo”. Feedback on “Desperate civilians wait for evacuations from Aleppo”.